When you grow up in Asgard, certain Earth customs might seem perplexing. 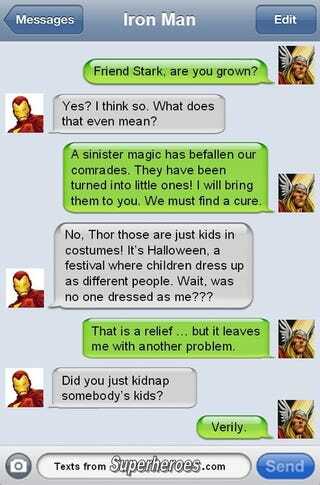 And when Thor is in the US for Halloween for the first time, it's a bit of a disaster. The always fun Texts from Superheroes has a Halloween edition up, featuring text conversations between Batman and Robin, the Joker and Lex Luthor, Iron Man and Ghost Rider—and a particularly brilliant costume discussion between Storm and Wolverine. Head over to Texts from Superhereoes to see them all.